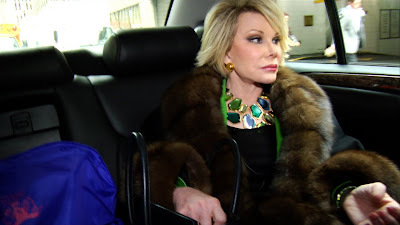 E1 Films will hold a free advanced screening of the popular Sundance and Hot Docs hit Joan Rivers - A Piece of Work. The screening will take play at Toronto's AMC Theatre at Yonge & Dundas on Monday August 9 at 9pm. The film has been critically well-received and is a frank portrayal of the sometimes controversial 77-year-old comedienne. To RSVP, email the address given below. Here is the information from E1's Facebook posting (but make sure you RSVP and not just respond via Facebook). Because you loved it so much, and we love you so much... Join us, the Shopping Channel, Xtra!, Proud FM and HOT DOCS on Monday August 9, 9PM, at the AMC Young & Dundas in Toronto for an encore screening of Joan Rivers- A Piece of Work! Please rsvp to filmpromotions@e1ent.com with the subject heading 'Joan'. The seating is strictly first come, first served.